Orbit diagram of asteroid 2017 BH30, which flew by Earth on Jan. 29, 2017. An asteroid the size of a pickup truck narrowly missed Earth late last night (Jan. 29), just hours after scientists first spotted the space rock. 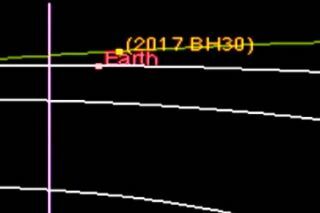 The near-Earth asteroid, known as 2017 BH30, zoomed within 32,200 miles (51,820 kilometers) of the planet, about 13 percent the distance from Earth to the moon. Closest approach occurred at 11:59 p.m. EST last night (0459 GMT today, Jan. 30), according to astronomers with the Minor Planet Center in Cambridge, Massachusetts. For a bit of perspective: The object that exploded over the Russian city of Chelyabinsk in February 2013, injuring more than 1,000 people, was estimated to be about 65 feet (20 m) wide. But asteroids have to be much bigger than that — at least 0.6 miles (1 km) or so in diameter — to wreak destruction on a global scale, astronomers have said. Astronomers have discovered more than 15,000 near-Earth asteroids to date, but the catalogue is far from complete; millions of rocks are thought to reside in Earth's neck of the cosmic woods.